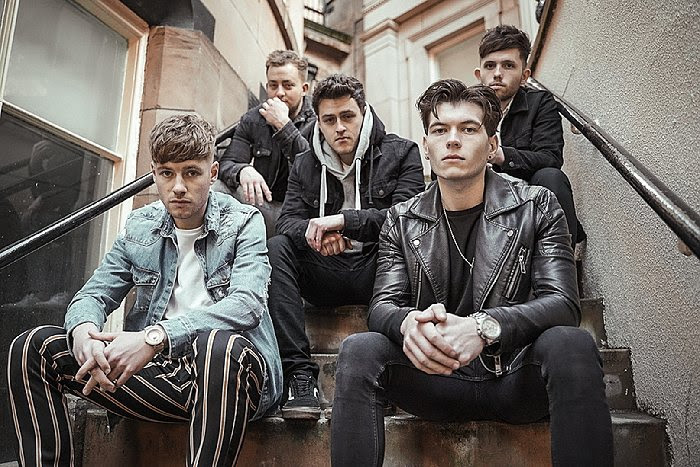 Jordan Evan, Lewis Stubbs, Ben Jones, Nathan Jones and Matt Thomas are Faded Strangers, an indie rock band who released their self-titled debut EP back in August. Last month they released new single ‘Merry Go Round’ and we caught up with Lewis to find out more about the band and their latest song. We’re very indie rock. We’ve still got the pretty vocals and nice melodies within our tracks, but we’re not afraid to mosh about in breakdowns. First up, tell us bit about yourselves - who are Faded Strangers, and what were you doing before making music together? So, Faded Strangers was originally created by myself and very close friend Jordan. I was working as an electrician at the time when the whole thing came about and I think Jordan had just started barbering on the back of his professional football career. We started writing some songs and decided to get Nathan and Ben in who then joined the band and we wrote our Debut EP. After that we decided we needed more guitar and vocals thus getting in Matt who me and Jord knew from a young age. I feel that growing up in the ‘indie’ scene, Arctic Monkeys were the most modern inspiration for myself. As well as that I’m a sucker bands such as Led Zeppelin, Black Sabbath, The Eagles, Rolling Stones etc. The list is honestly endless. I’d say between us all though, our inspiration honestly ranges between Spice Girls to Slipknot. Why the name ‘Faded Strangers’? ‘Faded Strangers’ was created by myself and Jordan. The more I say it the more I think what a terrible name. But I think I liked the word ‘Strangers’ and Jord liked ‘Faded’ and we just put them together. It does work in the sense that the band name goes hand-in-hand with soppy love songs. I’d say musically we’re very indie rock. We’ve still got the pretty vocals and nice melodies within our tracks, but we’re not afraid to mosh about in breakdowns. If you could collaborate with any living artist, who would you love to work with? Tell us about your new single ‘Merry Go Round’. What’s it about? Our new single ‘Merry Go Round’ is about complications of love and growing up. Sometimes it feels like we’re just spinning around in circles like a merry-go-round. Matt and I had the idea for the guitar riff, and then I think the whole song wrote itself from there. We played around with the vocal melodies for a while, but in the end we just went into the studio with Alex Quinn at Parr Street and created ‘Merry Go Round’. There was still a lot of figuring stuff out when we went into the studio, but that’s just how we like to do things. How does ‘Merry Go Round’ build on your style? I think ‘Merry Go Round’ was definitely a different direction for us as a band. It was a lot more ‘poppy’ than any of us were used to. Is that a style we’ll decide to stick with? I honestly don’t know. I couldn’t say what’s next in terms of music. But we always like to change stuff up. What are your hopes for ‘Merry Go Round’? I just hope that everyone who listens to ‘Merry Go Round’ enjoys it as much as we enjoy doing the whole band thing. If one person relates to it, or smashes it on repeat and it makes them happy then my jobs done as far as I’m concerned. What are your other plans for 2019, can we expect more releases and/or a tour? 2019 can expect a lot more releases, and if there’s a stage and a microphone we want to play anywhere and everywhere. We’re playing FOCUS Wales as our next gig, and couldn’t be more exited to get going on stage. That’s when we’re all in our element. If I could go back in time, I’d tell myself to put down the guitar, get a trade or degree and tell myself to stop complaining about wanting to be a rockstar. Watch the video for ‘Merry Go Round’ on Facebook below. For news and tour dates visit the Faded Strangers Facebook page.